One of my new favorite places is Great Harvest, the wonderful bakery on 1st Avenue North. 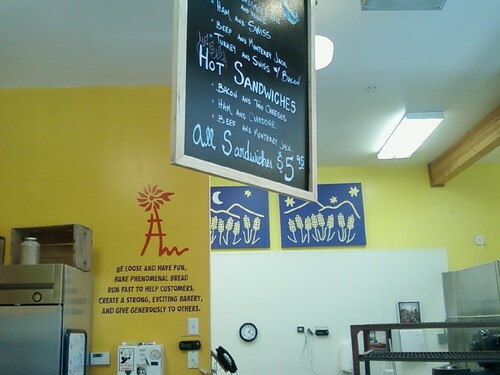 I just learned a few weeks ago that it is more than just a bakery – you can get some great sandwiches for lunch, too! And the bread…mmmm…perfection! I was pleasantly surprised to learn that our Great Harvest – the one right here in Great Falls – was the very first one, and that it is now a nation-wide enterprise. The folks that work there are super-friendly, and the “mission statement” as painted on the wall is both fun and inspirational: “be loose and have fun, bake phenomenal bread, run fast to help customers, create strong exciting bakeries, and give generously to others.” I really like the “run fast to help customers” part! Try the hot roast beef & mozzarella sandwich. It’s YUMMY! Unfortunately, for those of us that know and have eaten real bread, you know the bread you can get in NYC or chicago with hard crust on the outside and airy softness on the inside, Great Harvest does not make bread. I don’t know exactly what it is what they make, but it sure ain’t bread as one would gind in a traditional old-world German bakery. It’s also noteworthy that Great Harvest makes their version of challah, the braided egg bread eaten at the Friday night Shabbat meal, only on Christmas and Easter! Go figure! I know exactly what Walter is talking about. When I was a kid in CT my dad used to go to the Italian Bakery every Saturday and pick up a loaf or two of Italian Bread. I’d make a tasty sandwich, but the crust would always hurt my teeth. But I’ll admit I like both the “real” and not-real bread.